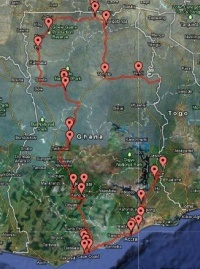 In January/February 2012 I visited West Africa for a second time. This time I had booked a private three-week tour through Ghana, Togo, and Benin. The tour was organized by Blastours, a tour company in Ghana. They put together a really great itinerary, organized the driver with 4WD vehicle, and booked all the hotels. All the visits to the attractions were included in the tour package. They also helped with getting the visas for Ghana, Togo, and Benin. I enthusiastically endorse Blastours, they did a fantastic job in preparing and running the tour. My tour guide and driver was Samuel Ametenwee. He was a great guide, very good at organizing things. For instance he managed to get our bumper welded and our air conditioner fixed on a Sunday afternoon. You can reach him through Elisam Tours. I did encounter one visa issue: You can only get a single entry visa for Ghana at the border. Since I needed to re-enter Ghana after the tour through Togo and Benin, I needed a second visa for Ghana. Blastours managed to get the second visa for Ghana while I toured through Togo and Benin, and had it ready when I returned to Ghana. I had no problem getting back into Ghana. If you do a similar tour, make sure to get a multiple-entry visa from the Ghana Embassy in your country before you leave, you cannot get it at the border. Sam, my guide/driver picked me up at the airport as agreed. He was not there when I came out of customs, probably because I had only hand luggage and was therefore faster through customs than normal. I found somebody with a phone and called him. He found me a few minutes later. On that afternoon we already started with a tour through Accra. While driving around Accra, I tried to get money from an ATM, but had a bit of a problem. I only had a MasterCard ATM card, I didn't bring my Visa ATM card. Most banks in Ghana (as well as in Togo and Benin) deal only with Visa cards. We managed to find one that handled my MasterCard, but it was difficult. I should have known better, since I had the same experience in Burkina Faso, Mali, and Senegal. If you want to get money in West Africa through an ATM, you are MUCH better of with Visa. I stayed overnight in a nice hotel on the beach. The next morning we drove west along the "Gold Coast" to Elmina. Driving around Accra was very bad because of the traffic. Once we were away from Accra, it got much better. The Gold Coast was one of the major slave trading areas in the 17th, 18th and 19th centuries. On the way to Elmina we stopped at a small but nice museum about the Gold Coast. In Elmina I visited Elmina Castle. It was built by the Portuguese in the 15th century. It was the largest and one of the most important forts in Ghana during the slave trade era. The southern parts of West Africa, the Slave Coast (from Nigeria through Benin to Togo), the Gold Coast (in Ghana), and the Ivory Coast (Côte d'Ivoire) were the major slave trading areas during the 17th, 18th, and 19th century. One of the local guides talked about how the slave trade worked. He said that he can't blame the white people exclusively. The slave traders usually did not go into the interior and abducted people as slaves. They gave the local kings money and weapons, and were given the subjects of the kings as slaves in return, so the local kings sold their own people into slavery. From Elmina we drove back to Cape Coast for my next overnight stop. Cape Coast also has a castle that was used during the slave trade era. Near the castle was a dance group performing their dances. I think they were just having fun, it was not an exhibition with entry fees. It was fun to watch the drummers and dancers. The guest house in Cape Coast was very nice with good food. For a while the electricity (and with it the running water) went out, but it was back when I needed it in the morning. The next morning we headed north to Kakum National Park. This park is supposed to have lots of animals, but I didn't see any. I was on a walk through some of the park and on the canopy walk around 10:00. There were no animals to see, not even birds. If you want to see anything, you have to stay overnight at the park and go on tours either late evening or early morning. Also, the area where the canopy walk is is at the edge of the park. I don't think you can see anything there even in the evening or early morning. You need to be further in the park to even have a chance. Altogether, I doubt that there is much to see in this park. After Kakum National Park, we stopped at Hans Cottage Botel. It is located on a small pond that has some crocodiles. At first I thought they were just stuffed crocodiles, but every once in a while they moved, so they were alive. The next stop was at Bosomtwe Lake (also Bosumtwi Lake). This is the only natural lake in Ghana. The lake is about 8 km (5.0 miles) in diameter. It was created some 1 million years ago by a small asteroid impact. The crater is about 10.5 km (6.5 miles) in diameter. That means that the impacting body was roughly 500 m (1,640 ft) in diameter. From Bosomtwe Lake we drove to Kumasi for the next overnight stop. I stayed there for two nights. The hotel in Kumasi was basic. On the second evening I didn't have any running water. It turned out that the water pump has to be turned on, it doesn't run all the time. On the afternoon of our arrival in Kumasi there was a huge thunderstorm right on top of us. The rain came down in buckets. This brought the already bad traffic to a complete standstill. We spend almost two hours in traffic, trying to get to a religious dance celebration. Unfortunately, the celebration didn't take place because of the rain. The next day we found out that they did the dance later in the night after 2:00 in the morning. The next morning we went to the market in Kumasi for a stroll around the market. It is a large market in the city that has everything from food to household items. Just after noon the Ashanti King held a reception for the local chiefs and dignitaries. It was an interesting ceremony to watch. A long line of local chiefs walks up to the king. The they pull down their gowns off both shoulders and bow to the king. It was quite a long ceremony. As I understand it, this takes place once every month. After the royal Ashanti reception we drove to the Bobiri Forest and Butterfly Sanctuary. I had a short walk through the local forest, but didn't see all that many butterflies. The next morning we drove north to the Mole National Park. On the way we stopped at the Kintampo waterfalls. While walking to the falls and back, I got bitten by some insect that created a real nasty swelling and inflammation on my elbow. This lasted about a week and was quite painful. Next stop on the way north was the Boabeng Fiema Monkey Sanctuary. We walked around the area for a hour or so and saw lots of monkeys. They have large troops of Geoffroy's Black-and-white Colobus (Colobus vellerosus, german: Geoffroy-Stummelaffe) (~200) and Mona Monkeys (Cercopithecus mona, german: Monameerkatze) (~500). This is a community where monkeys and human beings live together. The inhabitants in the town always leave food outside their homes for the animals. The monkeys see human beings as their own. Some of the monkeys are buried in a cemetery in the woods near the village. After crossing the Black Volta River at Buipe we continued on dirt roads to Mole National Park. I stayed at the Mole Motel, in the park for two nights. Early the next morning we went on a walking tour of the park. We saw lots of animals, including an elephant really close-up. After the walking tour we drove to Larabanga to see the mosque and the Mystery Stone. As everywhere, it cost money just to walk around the village and see the stone. The Larabanga mosque is one of the holiest mosques in Ghana. It is said to originate in the 15th century. In the afternoon we drove around the park. Again we saw a lot of animals. On this drive we were attacked by tsetse flies, while driving with open windows. It got so bad that we had to close the windows and stop animal watching. Tsetse flies find their prey by movement, not like mosquitoes by chemical cues. The moving car was the perfect target for the tsetse flies. The attraction of tsetse flies to blue and movement is used to kill them. People hang blue sheets of fabric that are impregnated with insecticide in trees. The blue color and the movement of the sheets attracts tsetse flies, and the insecticide kills them. I saw this a lot in Tanzania as well. After the game drive we went to a small local river for a leisurely row boat excursion. We saw quite a few birds along that river. The next day we continued north to Wa. On the way we visited the Wechiau Hippopotamus Sanctuary to see some hippos. We were on a small row boat. We did not get too close to the resting hippos. Hippos are very territorial and aggressive, so you have to be careful around them, they cause the most casualties of all the wild animals in Africa. In Wa we visited the Wa Naa's Palace, the palace of the local chief. We were not allowed in the palace. First I was told that there was some squabble between different people who wanted to be chief. Later I was told that the palace was closed because of renovations. I tend to believe the first explanation. We stayed overnight in Wa. The next day we continued north and then east to Navrongo, mostly on dirt roads. On the way we stopped at the Gbele Game Production Reserve. We walked around the reserve between 11:00 and 13:00 for a couple of hours. This was definitely the wrong time of day, we didn't a single larger animal. Even the birds were hiding, we saw hardly any birds either. After the overnight stay in Navrongo, we headed north to Paga to see the crocodile pond and the Paga Pio's Palace, the palace of the local chief. At the crocodile pond the guide took a chicken and fed it to one of the crocodiles. The crocodile seemed very sluggish at first. But when the local guide threw the chicken towards the crocodile, it reacted lightning fast and grabbed the chicken. It was swallowed very quickly. We then returned south to Navrongo and continued to Tamale. On the way we did a little side trip to the Tongo Hills to visit a local village. We stayed overnight in Tamale. In the afternoon after arriving in Tamale, we visited a local group of a few women who make Shea Butter from palm nuts. We saw part of the process in the afternoon, and the rest of the process the next morning. In the evening we went to a local restaurant where they had a song and dance show. It was quite interesting to watch. The next morning we continued east to Togo. On the way we visited a local village called Tindang. Apparently, anybody who is accused of practicing witchcraft can't stay in their local village. They are ostracized and then exiled to Tindang. There were however regular people with children in that village as well., so I don't know how much this is true today. Just east of Tindang we crossed the border into Togo. We returned back to Ghana near Kame in central Ghana. I did have the visa that Blastours had arranged, but the border officials had never seen such a visa. They didn't know what to do with that, so we all piled into our car and drove about 6 km (3.7 miles) into town where the boss of the border detail was. He OK'd the visa, so we returned to the border, I got the stamp in my passport, and we were on our way, all this without extorting bribe money, like the border guards in Togo and Benin did most of the time. From the border we continued north to Hoehoe to the Wli Waterfalls. I stayed there for a couple of nights. In the afternoon after arrival I walked to the lower fall. It was a one-hour walk each way. The next morning we hiked to the upper falls. This was a serious hike, about two hours each way. It involved climbing up a steep mountain for almost one hour. It was pretty exhausting, I guess I am getting old . I was scheduled to go on another hike of similar difficulty the next day, but I opted out of that one. After two days of 4-5 hours hiking each day I had enough. So after the second night at the Wli Waterfalls we headed south to Akosombo. On the way we visited the Tafi Atome Monkey Sanctuary. There are about 200 Mona monkeys around the village. We tried to feed them bananas, but both troops that we visited seemed to have had enough to eat, they were not enticed by our bananas. Like at the Boabeng Fiema Monkey Sanctuary, the people and monkeys live together peacefully. The monkeys are considered part of the community. Along the road heading further south are shops with displays of drum makers. I watched some of them working on carving drums out of large logs. At one of the stands, they started an impromptu music session with the different instruments that they had for sale. My guide participated in the drumming session. Early in the afternoon we reached Akosombo. The dam at Akosombo creates the Volta Lake, the largest man-made lake in the world by surface area. It is over 400 km (250 miles) long. It is important for power generation (six turbines) and irrigation. In the afternoon I took a boat tour on the Volta River downstream of the dam. We saw lots of birds during that boat tour. Towards the end of the tour, we passed a boat that was not moving. The people on that boat waved at us and shouted. At first we thought they were just greeting us. It turned out that their motor broke, and they needed help. We hooked them up to our boat and towed them to their destination. That turned the one-hour boat tour into a 1 ½ hour excursion, with further opportunities for bird watching. We stayed overnight in Akosombo. The next morning we started the final drive towards Accra. On the way we had a game drive through the Shai Hills Reserve. We saw some animals, especially quite a few birds. In a cave on the Shai Hills we saw a bat colony. From there we continued to Tema on the Gold Coast. As in all larger cities, the traffic was pretty bad. Just before Tema the air conditioner in our car quit again. My guide knew somebody in Tema who checked it out. It seemed that there was a small leak in the cooling system that let the cooling fluid leak out. He recharged the A/C and it worked again. From Tema we drove to Accra along the coastal road. On the way we stopped at the Artistes Alliance Art Gallery. They had paintings, sculptures, etc on sale, as well as antique art objects. There were some really interesting pieces for sale. Once in Accra, we did some more sight-seeing and looked at some more shops. I did finally find a small hand-woven rug that I liked. I stayed overnight at the same place where I spent the first night in Ghana. That was the last night of the trip. The next day was spent visiting the market, and some more shops. The return flight left at 23:15 that evening. When I started arranging the tour, Mimi from Blastours asked me what type of hotels I was looking for, 3-star or more basic. I opted for the less expensive, more basic hotels. It worked out OK for me. Most of the hotels that I stayed in did not have hot water, but with 30°C (90°F) outside temperature, you don't really need that. Fortunately, most of the hotels had air conditioning, which is certainly more important than hot water, especially in the south with the high humidity. Breakfast was basic, in many of the hotels they just had toast and butter and/or jam. Altogether, I was satisfied with the accommodations. I can live with basic facilities, I don't need 3-star hotels on such a trip. Food and beverages are fairly inexpensive. If you eat in a restaurant for locals, which I did a couple of times, it is VERY inexpensive. Local food is eaten with your hands. It is usually palm nut soup with some meat (beef, goat, chicken, or fish) and a sticky paste made from yam, manioc, or something similar. I had fufu once, and once banku. Fufu is made from manioc and plantain, and banku is made from maize and millet. The stuff is pounded in a big mortar, made from a log, with big wooden pole. After much pounding, it turns into a sticky paste that is served as a fist-sized ball. You pinch off a piece of the paste and use it to grab a piece of the meat from the soup, and to get some soup. My biggest problem was that I got the bright red sauce all over my beard . They always have a bowl of water on the table and a liquid soap dispenser to wash up before and after you eat. Vegetables are hardly ever included in the basic food. Some of the hotel restaurant food had some vegetables, but not often. For beverages, I always stick with bottled water and beer when I am in Africa. As almost everywhere in the world, the beer was German style lager beer, which is exactly what I like. It comes in 0.62 liter (1.31 pints). They cost between $2 and $4. The bottled water costs about $1 for a 1 liter (2 pints) bottle. Bottled water is the only concession I make concerning food and drink safety. I eat anything and everything, as long as it doesn't eat me first . Fortunately, I never have problems with travelers diarrhea, my stomach is used to having to handle all kinds of assaults . All along the roads you see small stores. There are basically no department stores in Ghana. Usually, there are several stores that sell the same things clustered together. A lot of food is sold at roadside stands. Street vendors that walk along the road are everywhere traffic slows down. Traffic jams, road construction, toll booths, and police check points all create business opportunities. We frequently bought fruit, nuts, etc from these street vendors. One unusual food item that was sold along the roads were "grass cutters". These are small antelopes, about the size of a large rabbit. Sometimes they had other "bush meat", some of it looked suspiciously like rats. All the larger towns, and most of the smaller ones as well, have regular markets. This is where most of the foodstuff is sold, as well as a lot of other merchandise. The markets in the larger towns are open daily, the ones in the smaller towns once or twice a week. In Accra and Kumasi there are a lot of what my guide called "nightworkers" on the streets and in the bars. Agriculture is of course one of the main livelihoods in Ghana. The main staples are millet and sorghum, and yam and cassava are the main root vegetables. In the center they grow a lot of tomatoes and onions. Also in the center is an area where they grow cashew nut trees. Plantains and bananas are the main fruits that are grown in Ghana. One of the main commercial crops are palm nuts, they are grown everywhere. There are two steps of extracting oil from palm nuts. The first uses the flesh of the fruits to extract oil from. This is a red oil, responsible for the mess in my beard when eating local food . The second step then crushes the nut shells and extracts oil from the nuts themselves. From this oil they make Shea Nut Butter. I watched the process in one small coop of local women in Tamale. The Shea Nut Butter does not spoil like regular butter. It lasts very long without refrigeration. I didn't see all that many cattle, they were mostly in the northern parts. Goats are everywhere, sheep somewhat less than goats. I saw surprisingly few dogs during the whole trip, they are very uncommon. In Accra, Tema, and Kumasi the traffic was horrendous. We spent a lot of time stuck in traffic jams. It was especially bad in Kumasi during and after the thunderstorm. Outside the big cities the traffic is usually not bad, except for the truck traffic on the major north-south roads. The truck traffic is mostly going to Burkina Faso. It includes a lot of tanker trucks. Burkina Faso does not have access to the coast, and there is no railroad between Burkina Faso and the coast, so all transport is on trucks. Horns are not used very much, quite different from for instance India where the horn is the most important part of a vehicle. In the south there was not much bicycle traffic, and only some motorcycles. The further north we were, the more bicycles and motorcycles were on the road. I only saw a few donkey carts. In the cities there are lots of people pushing and pulling carts by hand. In the cities there is street cleaning, but it can't seem to keep up with the garbage. The biggest problems are the plastic shopping bags and, especially in Accra, the sachets that they sell with clean drinking water. They are small, 0.5 liter (1.1 pints), so there are millions of them in Accra. They clog the roadside drains and make street cleaning very difficult. A new company venture, Trashy Bags, is using these plastic sachets to make handbags, but they cannot yet cope with the massive amounts that are being discarded. Most of the public transportation is in minibuses (as it is in most of Africa). These minibuses run on assigned routes. They charge about $1.10 for 35 km (22 miles), which is quite significant for the local people. Taxis are everywhere in large numbers. Taxis in Accra are about $5.00 per ride. The roads are mostly paved in the south. Further north there are more and more unpaved roads. In the far north most of the roads were unpaved. In the central part, the paved roads were often worse to drive on than unpaved roads because of the tremendous numbers and sizes of potholes. Speed limits are 50 km/h (31 mph) in the towns and cities, no limit outside. There are lots of police checkpoints on all the roads. Most of them seem to concentrate on trucks and business vehicles, but we were stopped a few times as well and had our papers checked. At one check point they even did a breathalyser check on my driver. On the drive to Navrongo, the mounting brackets of the big cattle-guard bumper on our vehicle broke. I was a bit concerned that the bumper would fall down in front of the car and we would go cartwheeling over it. My guide used a rag and tied the bumper down. In Navrongo he found a place that welded the brackets. Unfortunately, the first welding job didn't last long, it broke again during the drive from Togo to Benin. It was finally fixed in Benin in Natittingou. The weather was warm, around 30°C (90°F). It was extremely hazy, often you could hardly see the sun because of haze, even though there were no clouds. A few times the haze was so heavy that the visibility was only 1-2 km (0.6-1.2 miles). This affected my pictures a lot, many of them seem to be very grayish. This is not a problem with the camera, it is a problem of the very strong haze that grays out everything. It rained once while I was in Ghana, but that was an impressive thunderstorm. It brought traffic in Kumasi to its knees for hours. The south is very humid, while the north is much drier and therefore much more comfortable. In the southern parts of Ghana, almost all men wear regular western style clothes. Only at the formal reception of the Ashanti king did they wear traditional clothes. In the northern parts I saw some men wear traditional clothes, but even there they were in the minority. I saw only a very few men in Muslim clothes in the north, none in the south. Many women in the cities in the south wear western clothes, maybe half of them or even more. In the northern parts most women wear traditional clothes. Women always carry their babies on their back, there are not strollers in Ghana. People in the south are somewhat reserved, in Accra they were sometimes actually hostile. They do not like having their pictures taken. The children are friendlier, and often ask to have their pictures taken. Further north people are much friendlier, they smile more and mostly don't mind if you take pictures. 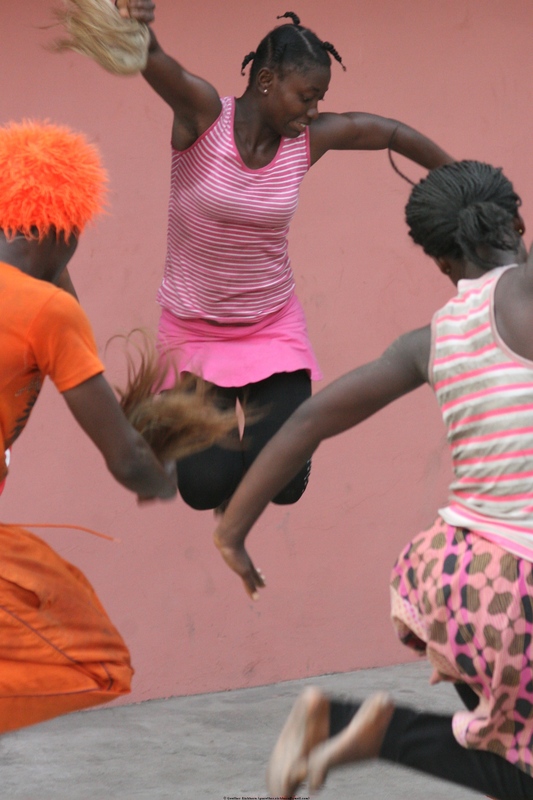 About 65% of the people in Ghana are Christian, 17% are Muslim, the rest are animists. They speak some 46 languages in Ghana. They have all the Christian sects that you can think of. Even small villages frequently have several churches for the different sects. Their education system seems to be in decent shape. Children go for six years to primary school, then three years to high school. College/university education is available at five universities in Ghana, with two more under construction. Weddings and funerals are both multiple-day affairs that take place from Friday to Monday. Both are elaborate affairs with food extravaganzas and music. For funerals, the people wear red and black. People over 80 or so wear white, as a sign that they have accomplished everything in their life and are complete. People don't smoke as much as in other countries. My tour guide said that women who smoke are considered prostitutes, and men who smoke are looked at as gangsters and drug addicts or dealers. People get two names at birth, one of the names is given according to the day of the week the person was born. For instance the name Kofi (like in Kofi Annan) is given on Friday. So there are lots of people with the same first name. It means Tourist Economy. It is just a way to extract money from tourists. In Eco Villages, everything costs money. Just walking around in an Eco Village costs you. This was a bit of a nuisance at times. I enjoyed my tour through Ghana. Of the three countries that I visited on this trip I had by far the best impression of Ghana. There seemed to be less corruption in Ghana than in Togo or Benin. In the north the people were friendly, in the south less so. It was altogether a good experience.